Self-esteem, or more importantly, the lack of self-esteem is an expected occurrence in a society that pays a high premium on the physical attributes of the body and face. The premium that is placed on good looks is not debatable, it has been a well -documented fact for almost a century. The proof is found in the amount of money that is spent every year on cosmetics, weight loss schemes, hair care products, scar and wrinkle creams and the myriad of other commodities used to maintain an attractive, healthy body and a youthful face and neck. The premium society exacts on us can affordably be paid with a healthy exercise program, a reasonable diet, a good skincare program including a sunblock, staying away from nicotine and in some cases, appropriately timed and well thought out plastic surgery. The science behind the latest lotions and potions to attack facial wrinkles is a multi-billion-dollar industry. These products, all of which work if actually used on the face and not allowed to languish on the bathroom counter. They are a good investment realizing the limitations of what can be achieved in an aging face only using products applied to the skin. Improved texture-yes, fewer discolorations-yes, fewer fine wrinkles-yes, improved coloring-somewhat, improved stretch marks- not likely and tighter, lifted face and neck skin-never. Dr. Paul Howard is board certified in plastic surgery and is one of the top facelift surgeons of the South. Dr. Howard also offers mini face lift, neck lift, eyelid surgery, rhinoplasty, brow lift, cheek augmentation, ear pinning surgery, and fat grafting to the face. Schedule your facelift consultation with Dr. Howard today 205-871-3361. Once the effects of gravity are in full effect, it is the rare person who can reverse the facial sagging without a surgical procedure. The timing of that face lift surgery, or mini facelift, will determine how much surgery is necessary; the earlier in the aging process, the less surgery. As a general rule, when the lower eyelid dark crescents reveal themselves, the nasolabial folds deepen, marionette lines form between the corner of the mouth and the chin-jaw area and the once tight jawline is interrupted by “bubbles” of fat that represent cheek fat and skin sliding down toward the neck, then anti-gravity, lifting surgical procedures are necessary. Facelifts, especially among baby boomers, have long been thought to be prohibitively expensive and thus available only to the few. Thus, plastic surgery is summarily dismissed as family and personal issues take precedence. Self-sacrifice becomes a way of life and self-esteem suffers, becoming very difficult to retrieve even with a successful diet and a perfect skincare regiment. The entire mass of skin and fat tissue from the lower lids to the jawline must be lifted, separately, which is the basis of the mid-face portion of the modern facelift. What is a modern facelift? Modern is a deceptively simple word with many meanings. A modern facelift is new, fresh and up-to-date as well as novel and innovative. To create a modern facelift sounds complicated but is deceptively simple for the plastic surgeon with an open mind and open ears. Two of my mentors, Dr. John Kirklin and Dr. Ralph Millard, coming from different backgrounds and directions (cardiac surgery and plastic surgery), both taught that if you listen carefully, the patient will tell you what’s wrong and what they want from you as a doctor. The modern facelift evolved from listening to patients with a completely open mind and blessed with a full toolbox of plastic surgery principles from which to choose and a creative disposition finding no limits to what is possible. A background in chemistry and anatomy has helped base the modern facelift securely in the realm of medical science; just as Dr. Kirklin would have demanded and Dr. Millard has written in Principalization of Plastic Surgery. The first facelift patient requests for something new in facelift surgery was the most challenging and time consuming but had not been addressed in the plastic surgery literature in recent history. Not a single person wanted to undergo general anesthesia to have a facelift, regardless of who administered the anesthesia. Was it perceived danger, expense or the fact that general anesthesia requires a large volume of strong drugs that make people sick? From the patient’s viewpoint, it was all the above. From the plastic surgeon’s viewpoint, it is the wild fluctuations in blood pressure these strong drugs cause as well as bruising, swelling, hematomas and a longer recovery that occur with all general anesthetic protocols. My unique use of three different and pharmacologically distinct local anesthetics was devised and in use today. The combination of local anesthetics burn less when injected, work quicker to make the face and neck numb and last longer reducing postoperative pain- all desirable traits. Each of the local anesthetics is augmented by epinephrine which helps to keep blood loss to a minimum. Oral sedation was chosen for the smoothness of onset, the slower metabolism of the drugs and the minimal effect on blood pressure greatly reducing the risk of hematoma. The oral sedation can be adjusted as necessary during the procedure per the tolerances of the individual patient and the amount of sedation desired. Patients requested for the modern operation to offer an equivalent result to other facelifts done under general anesthesia with incisions as short as possible. Initially, the short incisions sounded like a deal breaker but upon further consideration there are certain maneuvers concerned with the order and type of suturing that can shorten the incisions behind the ear. It was discovered that certain incisions in front of the ear served no purpose in making the results better and were dropped. While not exactly a “short scar” facelift, the modern facelift is definitely a “shorter scar” version of our previous facelifts. All patients requested less swelling with less downtime and a quicker return to work and normal activities. Everyone wants this and all plastic surgeons try to accommodate this request with very little success unless they adulterate or simplify the facelift procedure to be less invasive compromising the result. We realized almost immediately that the swelling was much less about the operation as performed but was mostly a product of general anesthesia, regardless of the agents used to put the patient asleep or anesthesia provider-nurse or doctor. Changing from general to local anesthesia reduced our postoperative swelling, all other factors being equal, by at least 75%. Even with improvements in swelling and down time with local anesthesia, more was needed as this was one of the more important requests. It was almost as important as cost. It was clear that the more so-called dead space that existed during the dissection of the face, the more hematomas, both large and small, and resultant swelling and bruising occurred. After the multi-vector, tightening of the SMAS, we began to use what is called progressive- tension- suturing which allows for maximal skin tightening with minimal dead space, minimal bruising and minimal tension on the skin closure helping reduce unwanted scarring and downtime. This suturing technique may sound too good to be true but it is well known, but not for facelift surgery. The technique also allowed us to decrease the size of drains and the length of time they are necessary. Our drains are hand-made from 21-gauge butterfly needles and are removed in less than twenty-four hours as the dead space to be drained is minimal. These “micro-drains” require only hemovac tubes as the suction and drainage receptacle usually draining no more than a teaspoon of blood per side. It is common for patients to inquire about facial plastic surgery and its effect on the mouth and peri-oral area. The answer is that the facelift, by itself, does not help rejuvenate the mouth. This was about the time fat grafting and Dr. Sidney Coleman burst on the plastic surgery scene. Using his new fat processing techniques, we were able to use a person’s own abdominal fat (or any fat for that matter) and inject the fat into the wrinkles and areas around the lips to rejuvenate, thinner, aging lips –permanently. Although not a specific patient request, adding contour to the effacement (flattening) caused by tightening and elevation of the cheeks was a constant struggle. Fat injections in the cheek area answered a lot of plastic surgeon’s prayers. We now could offer rejuvenation in a permanent fashion to the cheeks, lips, peri-oral area, nasolabial folds and marionette lines with fat injections. Unlike many other modalities, fat injections can be revised easily and are considered permanent. Most patients request more fat rather than less. The lower eyelids and their contribution to the mid-face aging process was all that was left to tackle even though it rarely was a request except by the most discerning of patients. The lowering of the thin eyelid skin from the effects of gravity onto the upper cheek with its intendant dark crescent circles and tear trough deformity could not be left unaddressed. This required lower eyelid surgery (blepharoplasty), cheek-lid blending, fat manipulation and sometimes fat grafting in the tear trough. This is most effective when done simultaneously with the modern facelift. Short scar facelift incisions with multivector SMAS plication, intraoperative open neck liposuction with jawline refinement, progressive tension suturing, micro-drains, fat injections to the cheeks, peri-oral, nasolabial folds, marionette lines, tear troughs and lower blepharoplasty with fat manipulation, septal closure, cheek-lid blending and temporary lower lid suture tightening. Anesthesia is multi-agent local anesthesia with oral sedation augmented with IM Toradol and clonidine to blunt the systemic effects of epinephrine. The price is under $10,000 all inclusive. Realizing our increased life expectancy, more people question how long the modern facelift will last. This is what Dr. Millard called a crystal ball question. He had a crystal ball on his desk that he referred to the patients accentuating the complexity of predicting the unknown. He would then explain that the answer depended on you, the patient, more than the surgery performed. He also would explain that aging is a continuous, life long process and any further surgical procedure may depend on the patient’s tolerance for imperfection rather than an identifiable time frame. When pressed he would usually say five years which seemed to please most people as a reasonable number. I tend to offer three years since my tolerance for imperfection is less than most and we have developed a number of inexpensive “tuck-up” procedures that address the aging issues that tend to re-occur more quickly than other aspects of normal aging regardless of the type and extent of the plastic surgery performed. Facial massage is a longstanding and proven method to aide in the healing process after facelift surgery. Surgeons instruct their post-operative patients to gently massage the facial skin with two goals in mind: smoothing of subcutaneous lumps, bumps and thickness from early swelling. Second, massaging away from incisions, especially around the eyes, is used as a “lymphatic drainage procedure” to decrease lymphatic stasis when incisions block the normal direction of lymphatic drainage. It is also important for patients to massage the incisions around the ear when they are in the phase of scar deposition as the incisions begin to thicken at about 6 weeks. Massage as a form of touching helps during the first 6 months when many patients complain of hypersensitivity and shooting pains due to the normal process of nerve regeneration. Prolonged numbness can be disconcerting to some; massaging helps the psyche integrate the numb areas back into the normal body sensations so that the numb areas cease to feel separate from the remainder of the face. Massage and wound care also engage the patient in their own recovery from facelift surgery, giving them tasks that will make them take ownership of their recovery. For the last 10 years, we have been doing extensive fat grafting with facelift procedures to address the effacement or flattening that occurs with all skin tightening procedures, especially in the cheek area. We also offer fat grafting in the lips, nasolabial and peri-oral region as there is very little that a standard facelift does to improve the peri-oral loss of fat with subsequent wrinkling. Attempting to tighten the cheeks enough to remove or affect the deepening nasolabial folds will not last and usually distorts the face in ways that are hard to camouflage. It should be an aphorism that you cannot lift the corner of the mouth by pulling of the lower face skin. For the first 2 weeks post-operatively, the patient is asked NOT to massage at all so as not to affect the fat grafts. Usually, we extend the “no massage” time to 6 weeks unless a reason to massage the fat grafts arises—this is a rare occurrence. Massaging the fat grafts in the face prematurely will cause the grafts to dissolve away. It is also important to note that massaging the face while bruising is still present can cause the face to bruise and swell more. We use standard marking pens to map the areas for fat grafting. Try as we may, it is difficult to remove these marks even with alcohol without having to rub hard enough to move the fat grafts once accurately injected. By the time that we start our staged suture removal, the marks are easier to remove with much less disruption of the fat grafts. Under no circumstances do we tell the patients to try and remove the markings. Patients are also instructed NOT to scrub their faces when washing, but gently pat the face to clean. Washing the face can mimic the massage-like pressure that we are trying to avoid during the healing process. The subject of facelift swelling is one that has driven a large part of my facelift procedures and practice over the last decade. It’s an easy subject to get your mind around because no one likes it, your reputation can depend on how much of it your patients have, once created it is hard to get rid of and regardless of how well patients are prepared for their surgery and the incumbent, yet evil swelling, they still feel like something is wrong when they have it. For years all plastic surgeons thought that the swelling after a facelift under general anesthesia was a necessary evil and therefore spent little time trying to figure out what causes it and how to prevent it. After years of failing to prevent swelling by doing small things that never worked like corticosteroids, drains, dressings, Vitamin K and dozens of other special medications and emollients. Being unwilling to accept failure, we started to question the basic tenets of doing a facelift. The most obvious and successful change was to stop doing general anesthesia for all facelifts. This was met with skepticism by many plastic surgeons that could not imagine operating on a patient for the hours necessary and have to deal with the anesthetic also. It was thought that the patients, usually a bit older than our average patient, wouldn’t or couldn’t tolerate the procedure “awake.” Concerns about the volume of anesthetic needed as it relates to toxicity and whether or not the entire face, neck and eyes could be rendered numb enough for surgery. All of these concerns quickly fell to the wayside; patients hated general anesthesia and the ability to anesthetize the face only required relearning all of the pharmacology of local anesthetics we learned in medical school. The only remaining question was whether or not the plastic surgeon (me) would exhibit patience in dealing with the conscious patient and subjugate the ease, comfort and lack of responsibility inherit in general anesthesia to the need and desire of the patient to have little or no swelling and a simpler, faster return to normal. The answer to the question for me was –absolutely. From that point forward, we worked out the details of the sedation, the local anesthetic agents, monitoring and significantly changed the operation to accommodate the wishes of the patient which were primarily based on having minimal to no postoperative swelling. The accumulation of the techniques of anesthesia and its agents, sedation, operating room ambiance and the ability to perform a first-class and lasting facelift under these circumstances has led to what we call the Howard Lift facelift and mini facelift surgery which include rejuvenating procedures for not only the face but the eyes, forehead, nose and neck. The Howard Lift is not necessarily a procedure but a new way to do facial plastic surgery concentrating on minimal swelling leading to minimal downtime and a first-class, longstanding natural result. Read more about facelift recovery. How is the LSL better than other Facelifts? The LSL is not a breakthrough procedure nor are any of the LSL techniques new in any way. THE LSL is first and foremost a marketing company that hires physicians to do a version of the LSL. In fact, their surgeons are not even required to do the LSL procedure. How is the LSL different than other procedures? 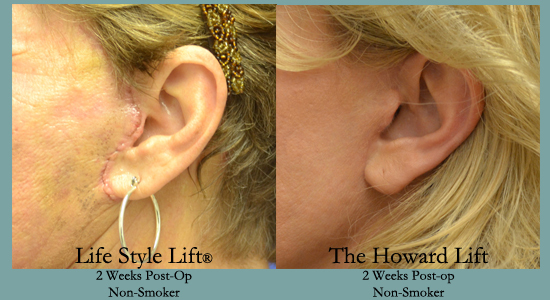 The LSL is a version of the short-scar facelift procedure that was first described by others. Included in the procedure is a so called SMAS plication which has been around for 20+ years and is one of many ways to tighten the deeper layers of the face. The only possible advance the LSL offers is that it is performed under local anesthesia which has been available since the 1920’s. Is the Lifestyle Lift® Cheaper? The cost of the LSL procedure is different depending on where in the country one lives. The fact is that the actual cost of the LSL is roughly equivalent to what most plastic surgeons charge especially when you consider the “fine print” procedures that are required on almost all patients. Is there a difference in recovery from the LSL? The rapidity of recovery depends more on the individual surgeon than the exact procedure performed. Patient selection is probably the most important adjunct in recovery time and LSL patient selection is initially done by “consultationists” without even a medical degree. One of the ways a plastic surgeon can decrease bruising is due to the technique chosen and in many cases whether or not the surgeon uses drains expeditiously. Part of the LSL marketing scheme brags about not using drains as if not using drains when indicated is somehow better. Are the LSL Scars Better? The short facelift scar pattern is pretty much the same for everyone. The execution of the scar varies from surgeon to surgeon, but the scars don’t seem to do as well nor are they properly positioned in many of the LSL procedures (my personal experience). It is also easier to obtain good scarring with frequent follow-up and in-depth patient instruction which is not typical in practices that are volume driven like the LSL. What is the Most Important Decision when Choosing a Facelift? Most people believe that the most important aspect of achieving good results in facelift surgery is the choice of SURGEON and not the procedure or any number of other considerations. It is interesting that the one thing that the LSL marketing scheme minimizes is the surgeon; such that the surgeon is the last person one meets in the process. The consultationists and the people who collect the money seem much more important and meet the prospective patient well before the surgeon is chosen for you. 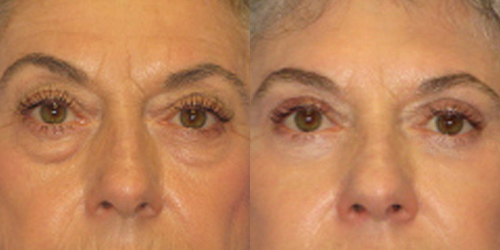 Read more about top facelift surgeon Dr. Paul Howard Birmingham, Alabama.